My favorite Creampuff and I share a mutual reverence for a certain cookbook - The Cake Book by Tish Boyle. 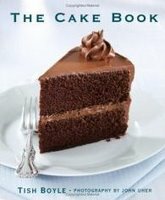 (My experience so far suggests The Cake Book's slight inferiority to Ms. Boyle's masterpiece The Good Cookie, but cake is better than cookies, so it all evens out.) Recently, Creampuff suggested that we make the same recipe from Ms. Boyle's collection and blog about our respective results. What an honor to blog alongside Creampuff - and when I discovered she'd invited two other talented bloggers, Peabody and Alpineberry, I was delighted. We jointly settled on a recipe and picked a date - today! Despite the "two-slice" difficulty rating (out of a possible four) Boyle gave this recipe, making it was no piece of cake. General two-slice difficulty was abetted by my resolve to use a real pumpkin, rather than a can of pumpkin puree. I've had some of my first experiences with butternut squash this season, and they were very pleasant and successful, so why not a pumpkin? First I had to learn about choosing a pumpkin. Any old jack-o-lantern, it turns out, won't do for pie - some pumpkin flesh is tough and stringy. Sugar pumpkins (also called "pie pumpkins") are best for pie, so I picked up a local organic sugar pumpkin at the Greenmarket on Sunday, and brought it home to make puree. How to make your own pumpkin puree: break off the stem of your sugar pumpkin and cut the little guy in half. wrap the cut side of each half in aluminum foil and place them on a baking sheet, cut-side up. Roast in a 325-degree oven for one hour, or until tender. Remove foil and cool completely (or at least enough so you don't burn yourself!). Scrape pumpkin flesh into a large bowl; contents will be stringy. Puree in batches; strain puree through a chinois (or use a regular strainer and a rubber spatula). Whew! So that's one ingredient... Seriously, though, I was really excited to have accomplished this part of the process. The pumpkin yielded more than twice as much puree as I needed, and I'm looking forward to putting the rest to another use (pumpkin ravioli, anyone?). A note about the cinnamon pumpkin seeds - Tish calls for hulled seeds (the green ones). But if you're using the seeds from your own pumpkin...then that would mean hulling them yourself. And that's absurd, if not totally impossible. And I like them better with the shells anyway. Position oven rack in the center and preheat oven to 350F. Lightly grease the bottom and sides of a 9x3-inch springform pan. Wrap the outside of the pan in an 18-inch square piece of heavy-duty aluminum foil to protect leakage in the waterbath; if you don't have big enough sheets of foil, cinch two together by stacking the sheets and folding in one edge multiple times, then opening the two sheets and pressing the seam flat. Finely grind pecans and crystallized ginger in food processor. If you have a large processor, add flour, sugar and salt and process until combined; add butter and pulse until the mixture forms coarse crumbs. If combining ingredients by hand, combine pecans and ginger with flour, sugar and salt in a medium-sized bowl; cut in the butter and rub it into the flour mixture by hand. Add the cold water slowly until the dough just comes together. Press the dough in an even layer into the bottom of prepared pan. Bake for 25-30 minutes until the crust just starts to brown. Cool completely on a wire rack. Reduce oven temperature to 325F. In a medium bowl, whisk together pumpkin, heavy cream, vanilla, cinnamon, ginger, nutmeg, cloves, and salt. Set aside. Beat the cream cheese with an electric mixer (using the paddle attachment if using a standing mixer) on medium-low speed until creamy, about 2 minutes. Gradually add the sugars, scraping down the sides of the bowl as necessary, and beat on low speed until well combined. Blend in the pumpkin mixture; add the cornstarch and mix just until blended. Add the eggs, one at a time, mixing after each addition, scraping down the sides of the bowl as necessary. Pour batter into the cooled crust. Place the foiled springform pan in a large roasting pan or baking pan; carefully pour enough hot water into the large pan to come 1 inch up the sides. Bake for 70 to 80 minutes until the center is set but still a bit wobbly (the cake will set completely when chilled). Immediately before serving (no more than one hour before), remove sides of springform pan and sprinkle turbinado sugar over the top of the cake in a thin, even layer. Caramelize the sugar using a butane kitchen torch, holding it about two inches from the surface of the cake and moving it slowly over the top until the sugar melts and turns golden brown (the sugar will not carmelize evenly, so be careful and patient). Preheat oven to 325 degrees. lightly grease a baking sheet. in a small bowl, whisk egg white just until frothy. add just enough of the egg white to the pumpkin seeds to coat them (it's not very much!). Add salt, sugar, and cinnamon, and toss to oat the seeds. Spread in a single layer over the prepared baking sheet. Bake, shuffling them occasionally with a metal spatula, for 15 to 20 minutes, or until they are dry and beginning to color. Place the pan on a wire rack and cool completely. 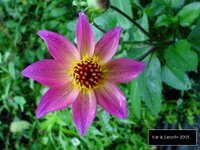 With your fingers, separate clumps of seeds. Store in an airtight container for up to a week. Oh man, two of my favorite things combined: pumpkin and cheesecake. Yum! Great post! Very festive for fall and Halloween. Love you and miss you! See you NEXT WEEKEND.... WEEEEEEEEE! Hi Kate, Much kudos to you for making your own squash puree! The carmelized top is a very nice touch. Excellent job. 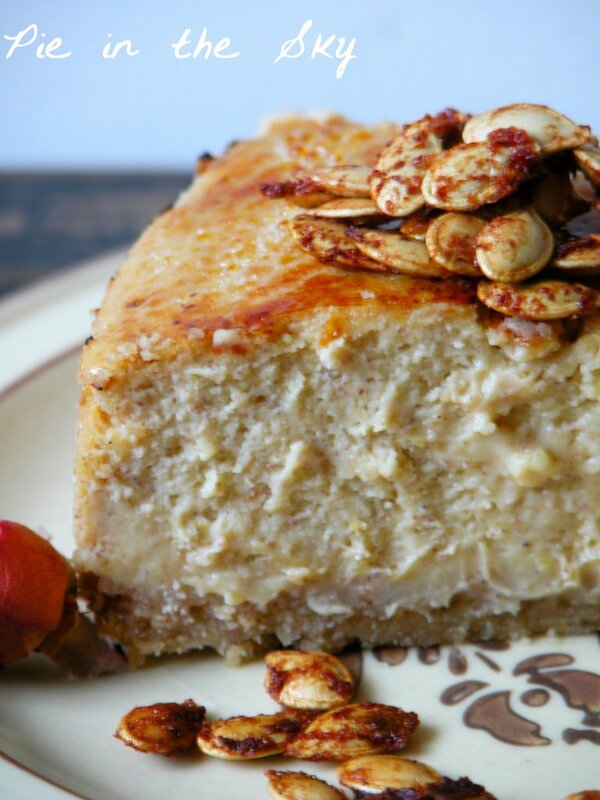 I love the use of the cinnamon spiced pumpkin seeds and making the brulee top! Here in New Zealand we do not really do thanks giving... but my Californian neighbour has invited me to a thanks giving dinner on condition that I bring pie. 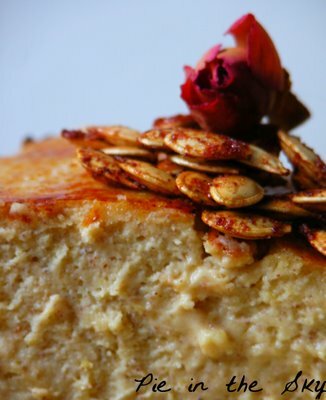 I was looking for a pumpkin cheesecake recipe and this looks delightful. Thank you! IF I was goingt to be in America for my favorite holiday of Thanksgiving I would make this for dessert. Alas, next years' Turkey Day menu is already being sketched out! Yummmmm! this looks really nice! 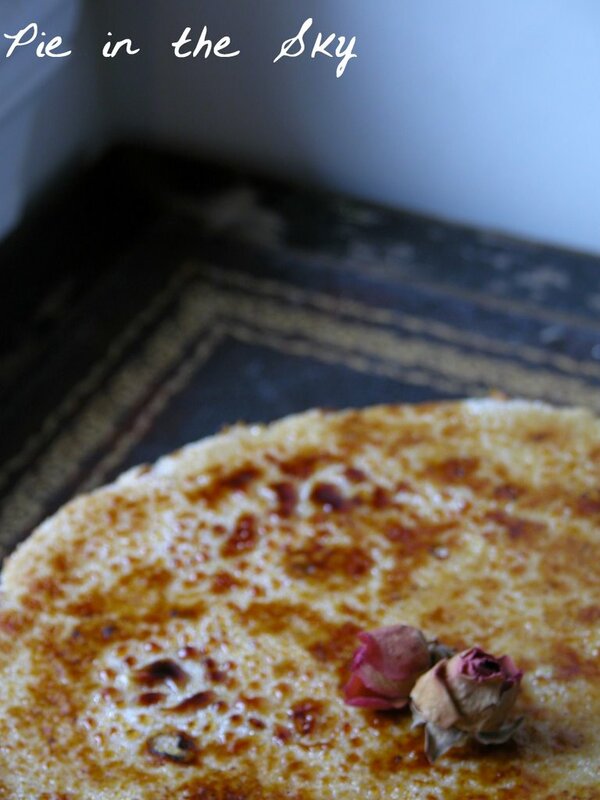 I love the brulee touch to it. I cannot believe you made your own puree!!! And the cheesecake looks incredible. Really ... you have outdone yourself! Wow! This looks great! I'm so glad to discover your blog (from Ivonne's)...I love your little egg souffles! :) I will be back for more! 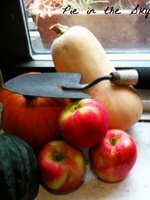 is a sugar pumpkin the same as butternut squash? I think I gained 3 pounds just looking at the photos. . . yum! al(lex)(andra) - can't wait to see you muffie! peabody - I *loved* your brittle! tim - I'm very flattered... good luck! kate - I can't wait to hear about thanksgiving in korea...will you celebrate? k & s - thank you very much! ivonne - I've decided i really love doing events with you. maybe we should do this more often? What a blast! knitter - nope! a sugar pumpkin looks like a regular pumpkin - orange and everything - but smaller, about the size of a small head of cabbage. angela - as soon as we finish constructing your apartment (READ: lean-to) on the roof. I love anything pumpkin...this recipe sounds so good. One of my favorite dishes is pumpkin as a savroy appetizer. I had it at the Helmand, and Afghani restaurant in Cambridge, MA. It was a kind of pumpkin dumpling...soooo good! Kate, you open this post talking about the "Requisite Taste Assessment" or R.T.A. I TOTALLY understand. After playing around with the idea for months, I just launched a food blog. When I'm not actually cooking something and deciding whether it's blogworthy, I'm thinking about things to try or reading food blogs or cookbooks or food sections (the New York Times and Chicago Tribune). And I am CONSTANTLY peckish. Constantly. Your cheesecake sounds amazing. And now at midnight (Chicago time) I must go raid the kitchen. So how does a butane torch make a cook real - it really does feel powerful doesn't it. Love it. Really cool that you made your own puree - the second time will be such a breeze. I've been able to do the small pie pumpkins in the microwave also. This looks like a killer cheesecake for Thanksgiving!! Now I must check out the others. Fun idea. So glad you all did it. Kate!!! We're so sad without you. More blogging! Kate, I check your website every day and every day, I am saddened by the lack on new posts. It's almost Thanksgiving! The season of eating! We need you!!!!!!!!! Don't worry, I'll get back to sous chef duties soon, and I'm sure you'll hear about Kate's Thanksgiving! After spending a wonderful Thanksgiving with Kate, I can tell you, in her absents from blogging, she has lost none of her superb cooking skills and she continues to make eating each morsel more enjoyable to eat than the last. She filled my kitchen with delightful smells and together with her sister’s culinary delights and basics from Mom; we had another memorable Thanksgiving repast. She flew home today to face a long late shift at work with two shifts to follow tomorrow, but I'm sure you'll hear from her soon. Even if I am her mom, I can tell you without bias or prejudice (her father is a lawyer), she's worth waiting for!! P.S. Kate, you sure made our Thanksgiving Happy! :) And J...good luck with the studies! I just wanted to let you know I really like your blog. It's been a month! Where are you? Wow this recipe looks great, I love make recipes, but as a difference with my husband he prefers to visit Viagra Online than cook delicious meals.